Professor Adrian Furnham's Occupational Attributional Styles Questionnaire can be used to measure how people attribute success and failure at work. Attributional styles have been shown to be predictive of successful and unsuccessful work performance. The way people decide the cause of their own actions has been shown to be fundamental to their success or failure at work. Optimists attribute their success to themselves whereas pessimists tend to attribute their failures to themselves. A measurement of attributional styles predicts organisational success and can therefore be used in selection and appraisal exercises. was first published in 1992.
available as software or paper based. enables you to determine if respondent has completed questionnaire. optionally allows you to email respondents with an invitation to complete. 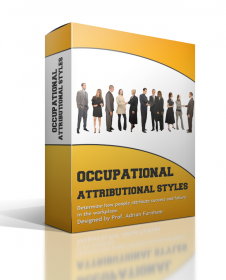 Occupational Attributional Styles Manual by Professor Adrian Furnham. Professional and expert assistance is provided by knowledgeable and capable staff. A respectable questionnaires to measure attributional style in the work place. Our approach is to measure attributions with specific workplace situations. We provide administrator links so you will be learning what motivates your people and leads to their success. You can compute and use your own norms as well as benchmark using others. Email us for a trial or further explanation.